Pang De always has a bonus -1 horse. Whenever Pang De attacks and the target uses an escape, Pang De can choose a card from the target and discard it. Pang De's "Horsemanship" gives him a bonus that stacks with another -1 horse when he has one equipped (i.e. 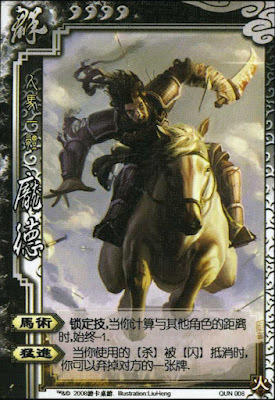 if he has a -1 horse equipped, Pang De has a physical range bonus of 2 and could reach someone three spaces to his right or left). When Pang De Attacks Zhang Jiao and Zhang Jiao plays an Escape, Zhang Jiao can activate "Lightning Strike" before Pang De activates "Sudden Attack." 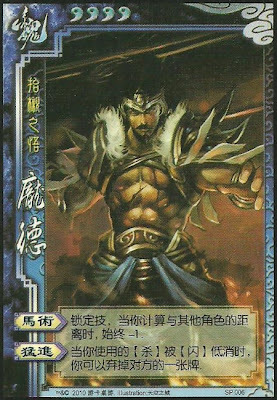 In effect, Zhang Jiao can target an enemy to flip a judgement card, then switch the judgement card via "Dark Magic," then Pang De discards a card. Pang De is similar to Lu Bu in that it is often more of a loss to Escape one of his Attacks than it is to take the damage. This gives him an advantage against extremely defensive characters like Zhen Ji, Lu Meng, and Cao Ren. "Sudden Attack" is useful against players who have the Eight Trigrams armor equipped, as the armor will only work one time against Pang De (since he can discard this card when they get their first red judgement). "Horsemanship" is a nice ability in that it increases his physical, and therefore, attacking ranges. Pang De has a great offensive prowess, but there is little room for advanced tactics. Pang De can be thought of as a combination of a card destruction and purely offensive character. He is similar to Zhang Liao and Gan Ning in that he can cost other characters a lot of cards, but he is also similar to Ma Chao, Lu Bu, and Huang Zong in that he is a very powerful fighter. The weakness associated with being a combination of character types is that he is not as good as any other these characters in their particular playing style. For example, if you want to be a purely offensive character, Lu Bu, Ma Chao, and Huang Zong are usually better choices. Zhang Jiao - Zhang Jiao has leverage against Pang De. Zhang Jiao's "Lightning Strike" goes into effect before Pang De's "Sudden Strike." It is not usually worth it for Pang De to expose himself to the extra danger associated with this power in order to discard an additional card after the power is concluded. Xiahou Dun/Sima Yi/Fa Zheng/Guo Jia/Xun Yu - These characters have abilities that are activated when they take damage. As a result, it is not a total loss for these characters to take damage from an Attack by Pang De instead of Escaping so Pang De can activate "Sudden Strike." Lu Xun/Zhang Chun Hua - These characters have abilities that dictate a minimum number of hand cards. As a result, Pang De's "Sudden Strike" is less powerful against these characters. King Pang De does not seem to be a good king choice. With no defensive abilities, he would crumble quickly as the rebels descend upon him. Loyalist Pang De is a competent Loyalist. "Sudden Strike" is useful for weakening rebels. Rebel The rebel role seems to suit Pang De the best. "Horsemanship" gives him a better chance of being able to reach the king and "Sudden Strike" is useful in getting rid of the kings cards and making him more vulnerable to the other rebels' Attacks. Spy Pang De seems to be competent in this role, but not outstanding. He should not have trouble with influencing the game, but he might not be powerful enough to do this quickly. In addition, there more resilient characters than Pang De that would have a better chance of surviving to the end of the game. It is difficult to assess Pang De's usefulness because he is not a particularly popular choice online. This may be an indication that he is not as good as the other characters, but that may not be a safe conclusion to make. It is possible that he is not chosen as often as other characters because he is a combination of a card destruction character and a powerhouse, and as such, there are other characters that fulfill either of these roles more competently than Pang De.